A Finnish e-retailer lists both the Nokia X7 and E6. 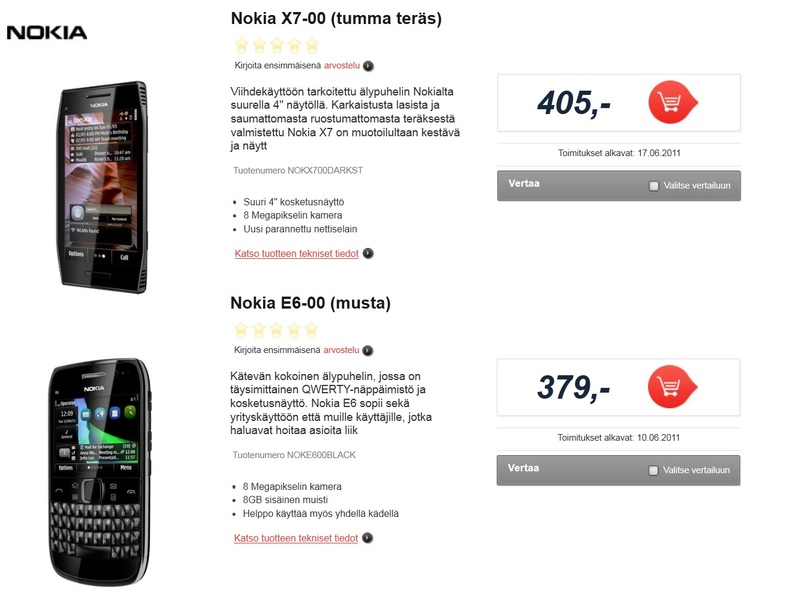 Note the difference in price from Nokia directly (which is almost always the case with Nokia pre-order). Instead of as much as 489 Euros for the X7, it’s 405 EUR. Likewise, instead of 429 EUR for the E6, it’s 379. Something else worth noting: markantalo.fi put delivery dates of June 10th for E6 and June 17th for X7. Now, the May 17th Nokia event is supposedly just for a local LAUNCH of the Nokia E6 and X7. The world “Launch” is a little confusing, often mixed up with “announcement” and actual availability of the device. Why would Athens require re announcing of the X7/E6 and Anna? This is just one retailer. The X7 and E6 could arrive before markantalo.fi’s expected delivery dates. That’s almost two months from announcement with E6 and over 2 months way with X7. Either way, that is far from “close to announcement” – though technically much “closer” than Nokia’s previous attempts.